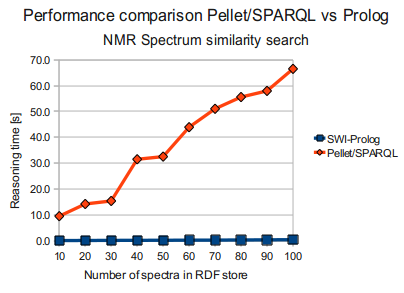 I was a bit worried over the performance of the RDF facilities in Bioclipse, as a SPARQL query for doing NMR Spectrum similarity search, including a numerical comparison run in Pellet (against datasets which are attached), were quite unsatisfactory, being some 2 orders of magnitude worse than some Prolog code I wrote for doing the same task (But of course, pure SPARQL with filtering is probably not what pellet is optimized for ...). [ nmr:hasShift ?s3 ] . % and collect them in 'Mols'. 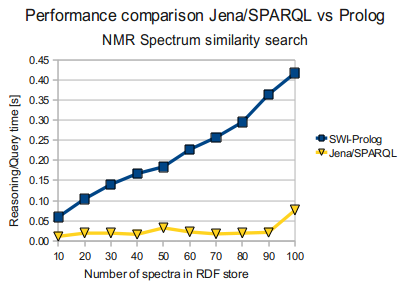 % match the SearchShiftVals, are collected. abs(Val1 - Val2) =< 0.3. % instead converting into a zero.